Like most reasonable folks, I've changed the Windows Update settings in my Windows 8 test system to Download updates but let me choose whether to install them. Normally, with Windows 7 when set this way, the system will notify me via a message near the system tray in the Taskbar (I guess it's the Action Center doing that). For a few days now I've had an update to Windows Defender pending, but have not seen a notification from Windows 8. The only reason I noticed it was that I saw a note on the lock screen, because I happened to log off and on to test something. Trouble is, I don't normally go through the lock screen on any of my systems, which are in secure areas and kept logged-on 24/7. Not that I can't go check for Windows Updates myself, but it was kind of nice to have the system notify me that updates had been received and were pending my approval to install. Anyone else seeing Windows Update notifications from the Action center, or is this just broken? The settings for showing notifications and allowing all users to install updates are REMOVED (read: simplified in Microsoft speak). Adding it to my list of features removed in Windows 8. If you check the Group Policies for Windows Update, you will realize that most policies for Windows Update behavior are not supported by Windows 8. (but supported up to Windows 7). Thanks for confirming, xpclient. Did you report this via Send Feedback? I did, though I'll be darned if I can scare up the link to it. At the moment an update is pending, yet I don't see any update notification, even if I open the Action Center. Don't I recall Steven Sinofsky saying something about Windows Update no longer bothering you on the desktop at some point in the //Build/ presentation? If their intent was to remove that notification, why not just configure the option that's already provided (and pictured in my screen grab above) by default to "off", rather than remove all knowledge of the pending update from the Action Center? That would satisfy the (perceived) need for the masses not to see update notifications, yet allow smart computer users to still have the feature, and there would be almost no development cost. Honestly, the direction they're taking with some of these features where they're just carving them out instead of defaulting the options that already exist seems a complete mystery. (Another one along these lines is the degradation of IE's font smoothing). That is a question I often ask constantly. Why not just turn off or disable by default instead of taking out existing features? I missed the notifications too and now I have to start WU manually. :( As I said, if you open Gpedit.msc and see the policies for Windows Update, they have taken out a lot of Windows Update related settings - they are no longer supported on Windows 8. They are becoming more and more like Apple, limiting choices and configurability of their software and "simplifying" everything so nothing remains customizable. Hard really for a Windows enthusiast to accept that because choice and customization is why I always chose Microsoft over Apple. A non-intrusive balloon notification is changed to an intrusive Metro-style dialog on top of the desktop UI? And the background is disabled unless you take an action - either Install or Close. Using Windows 8 Pro RTM in a domain and getting updates from WSUS, I have yet to see any notification whatsoever on the desktop when updates are available. I created a shortcut for Windows Update in order to see the available updates and approve them. I would accept the big full screen banner over nothing, but it's far from preferable. They did a similar thing for network connections, which opens a metro sidebar. Yeah, I have seen a notification on the desktop about one time myself, way back when, but never again. It was probably a "bug" they've since "fixed". Can we get in the habit of running Windows Update from time to time (on a machine that we don't regularly reboot)? Possibly. Do we want to have to? This is a clear case of making something worse in the new version, while trying marketing sleight of hand to make it sound "better". When the crowd applauded at //BUILD/ when Mr. Sinofsky said "we're stopping Windows Update from notifying you on the desktop" it became all too clear what kind of sheep they had managed to attract to that conference. I too would love to have the ability to have some notifications on the Desktop. The only place I now see a notification is on the pre-login screen that shows Updates are Available. I long to have the Task Bar notification back. I just discovered that i dont get update notifications on windows8 desktop. metro interface i never look at (throwed it in a very deep black hole. its useless) Also on login screen you only type the password. Now i read here that microsoft have also removed that IMPORTANT option. because now your run way longer with a less updated system. no notification balloon , no manual update. Basic rule this day is to disable auto updates in software. the give more trouble then fun. Windows 8 start to get a terrible operating system. because more and more important option are just gone that where available in windows7. only windows8 runs for feeling faster. Microsoft, bring the notification back to the desktop. still strange its removed anyway ! Like xpclient posted above. Oh xpclient, i have not seen that metro interface update screen :) maby because i dont use the metro disaster. Thanks pan_c. Can you re-create the UI with balloon style notification instead of Metro style? Maybe I will add an option to switch between Metro- and Balloon-style in the next version. Besides the few good things windows8 have, you only find more and more problems and bad things Hoped windows8 gives you less work after clean installation. instead you need to customize again more then with windows7. Programs that dont work right or crash faster. functions that are missing *start menu). useless functions added, metro, pintostart. windows update that restore registery keys that you have removed because useless function (pintostartscreen) Virusscanner that is so wonky as possible. software thats linked top metro applications default instead of the desktop. if microsoft would spend 1 year more before publish windows8 and spend more time for the desktop it would be really good. metro is a big mistake for desktops. Heading to harbor to let windows 8 sink and step back to windows 7. cant advise people anymolre to use windows 8. Yes, am not happy. not happy to leave winodws8 and for sure not happy to keep useing it. And people maby go say wait a bit longer. but dont have hope microstf fix the desktop soon. well i can always then switch sata cable to win8 disk. $objNotifyIcon.BalloonTipText = "1 new update is available"
$objNotifyIcon.BalloonTipText = $c + " new updates are available"
This works for me in an elevated PowerShell 3.0 window. For those without high-end PowerShell skills, could you please describe how the above needs to be run/managed to add update notifications? Does one need to run it once at login, once for all time, repeatedly as a scheduled task...??? I saw no problem running it here, but I'm not sure just how it's supposed to be used (hence my questions above). There have apparently been no Windows Updates for a few days. I found out it is not necessary to run PowerShell as an administrator for my script in my previous post to work. Again, change the filepath to a different location, according to your need. Place the .vbs file in your Startup folder ( C:\Users\Username\AppData\Roaming\Microsoft\Windows\Start Menu\Programs\Startup ) if you want it to run automatically when Windows starts. Here is the new and improved version of my script, I added some error handling to it so that it doesn't break if the internet connection dies. I forgot to mention, you can click the systray icon to get the balloontip back after it went away, and you can click inside the balloon to open Windows Update. $objNotifyIcon.BalloonTipText = "" + $c + " new updates are available"
$objNotifyIcon.BalloonTipText = "internet failed, new updates are available"
P.S. - The filepath for the icon used is "C:\users\username\desktop\Windows_update_icon.ico" (on the 7th line of the script) so you should edit the script to specify the correct filepath to an .ico file of your choice. I'll try the script later. Do you know what my error means? It looks like you ran the script twice so that the WMI query event subscriber is already registered when it tries to register (but like I already said in my first reply to this thread, the script requires PowerShell version 3.0 to run). The names WuaucltProcessHasEnded and WuaucltProcessHasStarted are just names that you can choose freely, so in case nothing else helps, maybe you could try editing the script by changing that to something entirely different? Windows 8 comes with Powershell 3.0, so this should no be the cause. I'll try it again later inside a VM. I've tested it on a "Windows To Go" Win8 Eval. Here's my third (hopefully final) shot at writing a script that works as intended. I'll try to explain what it does. It checks for new Windows Updates immediately when it starts, and continues to do so every 20 (the number on the first line of the script) minutes approximately. If it finds any, it displays a systray icon and a balloontip saying how many Updates were found. The icon should stay visible until all Updates have been installed, but the script will not install them automatically. If it fails any of its attempts to check for Updates (due to a failed internet connection or whatever), the script will keep retrying every 1 minute. Should it occur that additional new Updates are detected while the icon is still visible, the balloontip will not be shown a second time. To see how many Updates were detected, just click on the systray icon to bring back the balloontip. Optionally, click inside the balloontip to open Windows Update, which lets you choose whether to install Updates. $global:objNotifyIcon.BalloonTipText = "1 new update is available"
$global:objNotifyIcon.BalloonTipText = "" + $c + " new updates are available"
Excellent, though there still haven't been any updates lately with which to test it - no doubt people taking some much needed time off at Microsoft. Just to be clear, does this script need to be run once at every login (e.g., via a shortcut in the Startup group)? See my second reply to this thread; place the three lines of code from the first codebox in a .vbs file and then place this .vbs file in your Startup folder. After that, you either have to reboot or launch the .vbs script manually (by double-clicking on it) for the script to start running (using the .vbs code, the PowerShell script will start running inside a hidden PowerShell window). It's absolutely perfectly like the Windows 7 one. How can I thank you!! Even supports a registry value to change how often it will check. I've been using it for a few months myself, so I hope it works well for everyone else. Just to be clear, you'd like a menu option to hide the icon (even when updates are available) for n minutes? Yes I mean sometimes updates are available but I postpone them if they are not security updates or I have no time/not possible to install them on some machines right away. So until the next day (which is when I've scheduled the next reminder/check), having the icon in the tray isn't of much use. It can be a setting anywhere, could also be a reg value. Thanks in advance. It has relieved me of one of the many Windows 8 annoyances. wow, awesome. Thanks, I've installed itand wil see how it works on patchday next Tuesday. I don't think I have partial downloads because the files extract from the 7z without error. And they do not seem to be infected. Do you need to update the web page? Thanks for spotting that - bad mistake on my part (I forgot to update the sizes and hashes when I was copying the page from http://www.quppa.net/keiki/). I've corrected the info. btw, can you change the way the tool works? It would be nice if the tool would run as scheduled task, so that it is not require to have it running all the time. You might want to set up to download the pre-requisites or include the redistributable as part of the package. That's from my program, not pan_c's (which uses .NET). I include a link to the Visual C++ Redistributable on the application's webpage. I'm a bit reluctant to include the redists in the setup package due to their size, but I might make the notice more prominent on the webpage. I'll have a look at doing this for the next version. I'm very sorry - I only quickly scanned back to find the author, and clearly I made a mistake. You might consider statically linking in the needed routines from the libraries when you build the application, especially if you're planning to actively maintain the software over time. It's a nice tool you've built. Thank you. I am considering adding it to my Windows 8 book as another of the several freeware programs that can bring back essential behavior that's been lost. I'll echo Andre's request - it would be cool if it could be triggered by the Task Scheduler, so that it wouldn't be hanging around consuming (admittedly a small number of) resources all the time. By the way, I noticed something... Windows 8 stops getting Windows Updates for Windows Defender once you've changed to another anti-malware solution (Avast! in my case). I suppose that makes sense, but since I changed to Avast! coincidentally with starting of testing these update notification tools, it initially confused me since I thought the update notifiers were just not working properly. Though it's no longer pertinent for my test Windows 8 system, I like the "automatically apply updates for a list of KBs" feature you've implemented. Bravo! I include a link to the Visual C++ Redistributable on the application's webpage. I'm a bit reluctant to include the redists in the setup package due to their size, but I might make the notice more prominent on the webpage. You can also compile the application to link to the required runtime DLL as static libraries into the application. Minor issue: I set WU settings to "Never check for updates" so I don't get redundant and ugly Metro style notifications, only get notifications from WU Notifications Tool. In that case, WU Notification Tool quits saying "Updates are being installed automatically, exiting...". 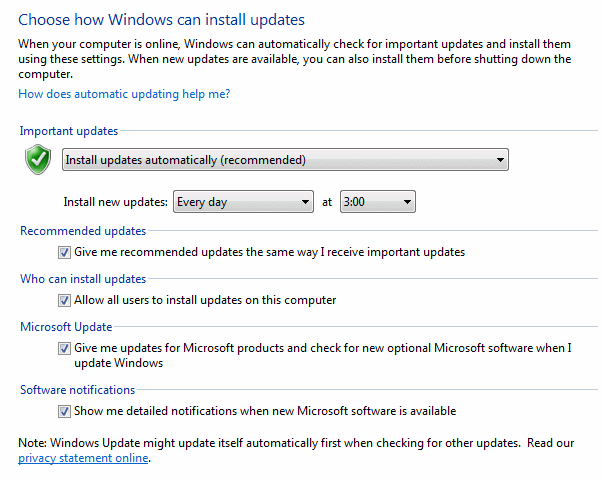 It should only do so if settings are indeed set to "Install updates automatically". Just to be clear, does the WU Notification Tool run (and do update checks) even though you've set the system settings to "Never check"? Perhaps the more appropriate behavior (if possible) would be for the application to do whatever magic is needed behind the scenes to disable the Windows-driven update check but implement the setting itself - that way seamlessly replacing the entire (now broken) Windows Update process with something that works. Yes it runs but it determines (from what it says) that WU is set to install updates automatically and therefore it quits. I haven't made the 'check once' option the default as it doesn't make much sense if one chooses to leave the icon visible at all times. Nice! With /checkonce it's now possible to create a scheduled task that will run WUNotify (e.g., at a particular time of the user's choosing), and the application doesn't need to remain running. It's lightweight but many folks like to minimize the number of running processes. 1. Rebooted after installing WUNotify. 2. Started a CMD window (it's always elevated as I have EnableLUA set to 0, so UAC is off). 3. WUNotify put up the balloon that showed "Updates are available", so I clicked the balloon. 4. I saw the control panel page for Windows Update, verifying that there are updates available, then canceled it. 5. I saw WUNotify remain active in the Task Manager. Does the notification icon remain visible? With /checkonce the program will remain running if there are updates available - it will only exit if there are no updates available. If the process remains but no icon is visible, I must have made a mistake somewhere. I can't see an icon, but the tool is still running even if I start it with the /checkonce and no updates are found. In the case I outlined above I see the icon in the "hidden" portion of the System Tray, but not the visible portion where it shows up when notifying me of the pending updates. Perhaps when used in the /checkonce mode, assuming it exits properly, should we set it to always "Show Icon And Notifications"? To test it, I went ahead and installed the pending updates. I like that it put up "A restart is needed". Nice. It didn't automatically trigger a restart when clicking on that balloon though. Instead it brought up the Windows Update control panel but curiously there was no Restart button... Just a message that stated "some updates will be installed when you restart your system". I guess that's not too bad. After rebooting and finding no other updates available, WUNotify.exe is still seen running. The Command Line shown by Task Manager confirms it's being run with /checkonce. At this point, just as Andre reported, there is no icon in any part of the system tray. Fooling with it further, in an attempt to check the configuration, now I've got two of them running - one with /checkonce and one not. I think it may still need a little work, but wow, it'a GREAT start to reasonably working around Microsoft's botch-up of Windows Update notifications. Thank you. I've released another update (version 1.4) - hopefully /checkonce works properly now (no more lingering processes). The program is now limited to one instance - if you run it a second time, the running instance will display a balloon notification and unhide the icon (if it's hidden). I've noticed the missing 'restart' button, too. I don't recall experiencing this in previous versions of Windows - perhaps this is new to Windows 8. I don't think I can tell the difference between when there is a 'restart' button and when there isn't, as in both cases the RebootRequired property of ISystemInformation returns true. For version 1.5, can you automatically create a scheduled task which runs your tool? In the meantime, if you run the tool as admin and select 'Run at startup', it will create a scheduled task which you could then modify. I would like this feature for 1.5 too. :) Btw, I found a neat little program called StartupUnblocker (http://www.jimmah.com/vista/Applications/autostart_admin_program.aspx) that automates the process of adding any program to NT6's Task Scheduler at startup with admin privileges. I don't mean to be a pain, but from all the tweaking I seem to have invoked a problem of some sort. I can run the tool from the start menu, no problem. The icon shows up in the system tray and I can configure the tool. It's probably my fault - I've probably screwed it up by experimenting somehow, but I thought I'd let you know. Did you use the installer? Turns out I forgot to upload the installer for 1.4, oops :) Re-installing should fix that error. If you downloaded the 7-zip archive (which I had updated properly), I'm not sure what the issue might be. I had used the installer, yes. I was seeing that message before with the prior version as well, so things make sense. I just reverted my Windows 8 test VM to a snapshot before having tried WUNotify, and started again with your installer, then modified your scheduled task to include the /checkonce parameter and to run every day as well as at login. Now it's working without an error message. My thinking is this: Say I have scheduled a /checkonce run every 4 hours. In this case, if I put off installing an update your tool will simply notify me every 4 hours that an update is pending. Like Andre above, however lightweight WUNotify is, I would prefer not to have it running constantly. But since the Task Scheduler service IS always running no matter what, having WUNotify run periodically by it seems a good idea, and (unless I'm missing something) it seems that this gives all the functionality needed. Thanks, that's a good idea. I'll add that for the next release. Oh, and by the way, I had a case where I was unable to click on the balloon itself to open the Windows Update panel. Logged-in, and saw the above. Started IrfanView from an icon on my desktop (I used this application to capture screens). Tried to click on the above. Nothing happened. Clicked on the actual icon in the system tray. Windows Update opened up. Edit: I just tried it again. As it turns out one doesn't have to do anything fancy - the balloon itself seems unclickable here. The old Windows 7 notification would allow you to click the balloon itself as well as the icon. That might be a nice addition to your tool. Another data point: This time I logged-in, saw the above, and WAS able to click the balloon. Clicking the balloon should open the Windows Update UI, but I think I've experienced the same issue before. If I run the tool a second time and click the 'already running' balloon, it consistently opens the Windows Update UI - can you confirm that this works for you? Yes, I seem to be able to click the "already running" balloon successfully. Not sure what to advise, other than maybe to try to reproduce the issue and watch ProcMon to see what's actually being delivered. With most Windows programming the obvious things do most of the job, then you have to bend over backwards to make things work 100%. Update: It's intermittent. Sometimes I'm unable to click on that balloon. I have a new issue. today I got the notification about an update, I installed the update and now icon is still there and shows a tooltip that updates are available which is no longer true. Hm, not sure what might be causing this. Are there definitely no updates available after you click 'Check for updates'? Do you get the 'updates available' notification when you restart the tool? For me, after installing updates today, the icon hung around for a little while, then disappeared. I have it scheduled to run at login and every 6 hours with /checkonce. Looking forward to the next version that will just re-issue another "Updates are Available" message if it finds itself already running because I've put off installing them last time it notified. I haven't deconfigured Microsoft's Windows Update from "Download and Notify Me" to "Never" yet - guess I'll do that next and see if I can get the Action Center to stay quiet about it. Once again, thank you for your work on this, David. Good luck finding Andre's issue; both of you let me know if I can help test anything with regard to that. ok, the latest Flash update is buggy. I see it in the list of installed updates 3 times, but when I check for updates I see it over and over again. That's why the Icons is still there. David, I've seen the "Failed to Create Notification Area Icon" several more times. 1. Set up WUNotify to run at Login and 6 hour intervals with the /checkonce parameter, as I noted above. One additional thing: I set it to run another instance if one was already running, anticipating that it would cause another reminder to be emitted every time it runs on schedule in the case where a system is left logged-on with pending updates for a while. 2. I saw it emit "Updates available", but I ignored it. 4. I logged on, and the error message came up. I've released version 1.5 which (fingers crossed) should solve these issues. As suggested by Andre and xpclient, I've added the command-line options '/createtask' and '/deletetask', designed to be used with /checkonce. /createtask will create a task that runs the program with /checkonce daily and opens the task scheduler UI so you can adjust it as you see fit. Running a second instance will re-display the 'updates available' or 'reboot required' balloons as appropriate, rather than always displaying the 'already running' notice, as suggested by Noel. Finally, I made some adjustments to the Shell_NotifyIcon code which I hope will make it more reliable and mean no more 'failed to create notification area icon' messages. Please let me know if clicking on the balloon still sometimes fails to open the Windows Update UI (note: nothing will happen if you click the 'already running' balloon tip). That's great! You've really polished it into something useful, David. Now we have but to wait for more updates to be released. As Andre and I have anti-malware software other than Microsoft's, I suspect that it may be a few days before we can give you more useful feedback. thanks for the new version. I'll test if it works correctly this Tuesday when there is the next Patchday . By the way, I didn't notice before... Does the utility emit any sound when it notifies you? I had my Win 8 VM minimized, but I just brought it up and lo and behold the notification was there waiting for me. It proceeded to fade out nicely. I invoked the thing again from the Task Scheduler manually, and it just put up the notification again (no sound), and faded out again. Assuming the lack of a sound is intentional (I think Windows 7 worked that way) it looks like it's working just right. Outstanding! It's a great notification tool and (when run with /checkonce) adds no running processes in the normal (between updates) case. Glad to hear it's working correctly. Thanks for all the feedback. If you follow xpclient's instructions to enable balloon notification sounds you should hear something, but otherwise there will be no sound. Can you please fix this for the next version. I'm afraid I might not be able to fix this since the Windows Update API indicates that a reboot is required even when other updates are still being installed. Does WU has an API call to check if WU is still installing updates? I saw that too, but I figured I could live with it since I manage the update process pretty closely and avoid doing other things during update installs anyway. 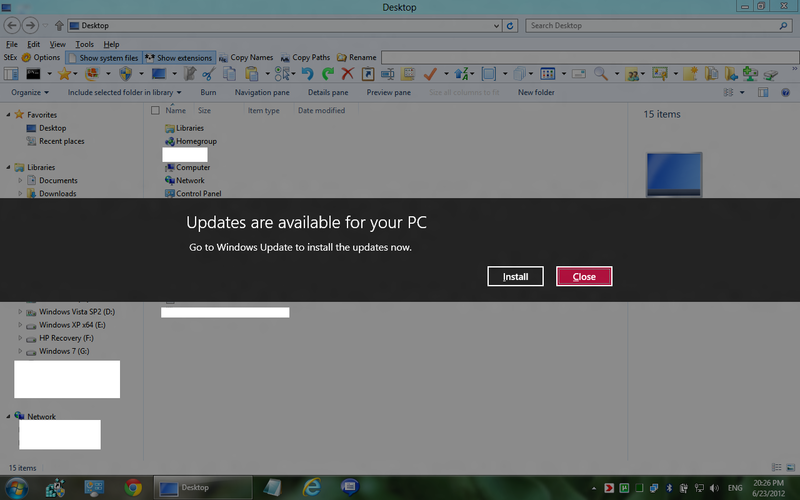 And besides, doesn't David's notifier balloon (if clicked) just take us to the Windows Update panel anyway? Could you somehow accidentally start a reboot too soon (other than manually)? I haven't actually tried clicking it when it came up requesting a reboot. But hey, if you can polish it to where it waits until the updates are done, by all means do. More accuracy is certainly better. I haven't actually tried clicking it when it came up requesting a reboot. me too. I don't want to risk a damaged Windows. Clicking the balloon or the icon will always open the Windows Update UI - the program will never restart your computer. It seems that the current message ('Restart now to finish installing updates') makes the functionality of the balloon sufficiently ambiguous that I should change the wording, but this is difficult as I'm relying on strings defined in wucltux.dll. Maybe I should append something like 'Click here to open Windows Update' (Andre, can you suggest a good string for German?). There's no API for checking whether update installations by the system are in progress. My original plan for this program was to somehow monitor the existing Windows Update user interface (in explorer.exe) - if I could do that, I'd be able to avoid displaying the 'restart required' message prematurely, but I couldn't figure out how, even with the help of Process Monitor. My second thought was to monitor WindowsUpdate.log, but that has its own issues - it reports hidden updates as being available, for example - so I ended up using the Windows Update API to make a program that's basically independent of the existing user interface. Just noticed that the notification icon will disappear if Windows Explorer crashes or is restarted, and running the tool a second time will bring up everyone's favourite 'Failed to create notification area icon' error :) I'll fix this for the next release. The program is now available in Polish (thanks Barnaba) in addition to English and Japanese. Thanks for the new Version. How can I translate it to German? Thanks so much for updating it. One thing I wondered: if uninstalling, WUNotify.exe is not exited if already running so maybe it should do that? It unintalls leaving the running WUNotify.exe as it is. (Not that I would ever uninstall this useful tool). You're right. I guess I assumed InnoSetup would handle that automatically, but it looks like I can configure the uninstaller to kill the process (the installer already prompts you if the process is running). Thanks as well, from me. Install went in no problem.